Village is Prepared and Ready, Are You? The National Weather Service has issued a Blizzard Warning for Downers Grove and the northern Illinois region which will be in effect from 3:00 p.m. on Tuesday, February 1, through 3:00 p.m. on Wednesday, February 2, 2011. Expected accumulations for this storm range from 8" to 12", with the possibility of up to 2ft. of snow. At the peak of the storm, accumulations of 1 to 3" per hour are possible with winds from 20-25 mph, gusting to 35 mph. The peak hours of the storm are estimated to occur between 8:00 p.m. on Tuesday to 6:00 a.m. on Wednesday. Driving conditions may be hazardous with white-out conditions and visibility of less that 50 ft. High winds may cause up to 4ft. snow drifts. Updates will be posted to the Village website as they become available. 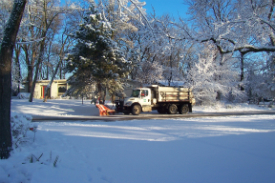 Snow Removal: The Village is prepared to run snow plow operations 24-hours a day throughout the duration of the storm. At the height of the storm opening main roads will be a top priority, including roads leading to Good Samaritan Hospital and those adjacent to schools. During an average snow storm event, each of the 10 routes within the Village Snow Removal plan would be completed within 2 to 2.5 hours. If snow falls at the rate of 1 to 3 inches per hour as predicted, getting to bare pavement will take considerably more time than usual. Areas that may have already had a plow pass through may be covered again shortly after, so please be patient as crews work to clear the roadways. Staffing: Extra Village staff are on stand-by to deal with the storm emergency. Police Department Staff will be held over and additional officers will be called in if needed. An additional ambulance for Fire Department services is also available. Warming and/or Emergency Shelters: The Village is prepared to appropriately assist those who may be in need of these services, depending on conditions. Grove Commuter Shuttle: The Village is prepared to provide service to commuters on Tuesday evening, however, weather conditions may impact the bus schedule. Please be patient. Decisions concerning operations on Wednesday morning will be forthcoming. Garbage Collection: Republic Services expects to be operating on Wednesday, February 2, unless conditions prove to be unsafe. Any announcements regarding the garbage collection schedule will be updated on the Village webiste. Parking on streets or Village-owned parking lots (including Metra commuter parking lots) is prohibited between 9:00 p.m. and 6:00 a.m. when three or more inches of snow have fallen in a 24-hour period. Follow your school's protocol for receiving emergency school closing information or check the website emergencyclosingcenter.com. PLEASE SHOVEL AROUND FIRE HYDRANTS and keep them visible. This can save precious minutes for firefighters in an emergency. Check on your neighbors, especially the elderly. Try to maintain a path to the front of your home, in case of an emergency. It is against Village ordinance to shovel, place or blow snow or ice onto the street, sidewalk or any right-of-way. If you are able, please be a good neighbor and shovel your sidewalk and assist those who may not be able to do so. In the event of a power outage, please call ComEd at (800)-334-7661.